Warsaw event celebrates connection between Christians and Jews, awards Poles who risked their lives to save Jewish people from the Nazis. An event held last Monday at the Royal Castle in Warsaw celebrated the connection between Jews and Christians. Jonny Daniels, Chairman of "From the Depths" said: "Last Monday evening we came together, at the Royal Castle in Warsaw for the 'Silent Hero Mosberg Awards' not to discuss antisemitism, or hatred, we came together to celebrate the highest form of love and Godliness there is, risking your life to save the life of another." "We came together as Jews and Christians from all across the political spectrum to say thank you, and to say that not just the actions of these Silent Heroes would never be forgotten, but the essence too." 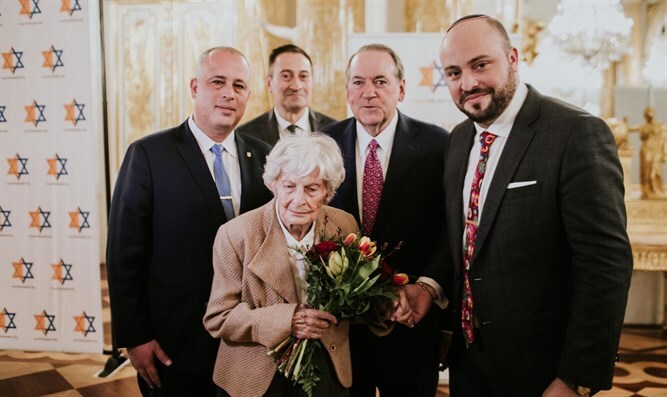 Deputy Speaker of the Knesset Hilik Bar (Labor) and American politician, pastor, former Governor of Arkansas Mike Huckabee were honored guests at the awards ceremony. Władysław Sajkowski was born in Gostynin on June 27, 1923. When the ghetto was established in Gostynin, Władysław passed food to Jews trapped inside. Through one of the Jews in the Ghetto, Mr. Shlomo Motla, who was an electric radio technician and had a pass to enter and exit, he provided bread, milk and honey. Shlomo knew when the ghetto was due to be liquidated and one morning before the liquidation he came to Władysław's house with his wife, daughter, mother and two sisters. They had only small bags with personal belongings with them. Władysław had already been hiding a non-commissioned officer of the Polish Army, Konrad Swacha. The women hid in the cellar under Władysław's sister's apartment, and Władysław, Shlomo and Konrad settled in a hiding space near the barn. They hid for a week. He then helped the Motla family cross the so-called the green border with the General Governorship. After some time he received a letter from them, in which they wrote that they had successfully arrived in Warsaw. However, it is not known if they survived the war. Kazimiera and Leon Frączek lived during the war with their children in the city of Czechowice-Dziedzice. Leon was active in the Home Army and he organized hiding places for people who managed to escape from transports to Auschwitz. One day, he pulled a Jewish boy out of the train, who looked remarkably like Leon's son, Lesław. The boy was taken under Frączek's protection. He was so similar to Lesław that everyone thought it was him. The boy was hidden for 6 weeks. In addition, Lesław Frączek together with other children took food to the local monastery, where Jews were hidden. During World War II, Irena (born on January 30, 1913) and Władysław Siła-Nowiccy and their daughters Maria and Ewa lived in Wyląg (part of Kazimierz Dolny). There, a young Jewish lady, Barbara Nowak, came to them. She had miraculously avoided one of the transports to the German Nazi death camp of Majdanek. Siła-Nowiccy took care of the girl by employing her as a carer for her daughters. Władysław arranged false documents for the girl, thanks to which she could safely move around the area. Thanks to the care of Irena and Władysława, Basia managed to survive the German occupation. After the war, the woman married and remained in friendly relations with her guardians for many years. In the village of Rzążew, Władysław Borkowski (born in 1902) ran a farm. His house was off the beaten track of the village. He lived with his wife Marianna and three children. Władysław hid three people of Jewish origin, all from the city of Zbuczyn. They were in a hideout under a cowshed and hidden in their home. Jan, the son of Władysław, says: "The Jewish family was with us for two or three months - and as the police began to search and they warned my father, my father gave them speech." Three Jews found shelter in a forest dug-out. A Russian lived with them. After a time, everyone was captured. The Russian handed over the Jews and pointed to Władysław Borkowski's farm as their earlier hiding place. The Jews were tied to the tree and executed. On April 10, 1943, the gendarmes went to Borkowskis, who were just working in the field. The Germans led Władysław towards the house and then towards the forest. Jan remembers: "[...] my father, as they were leading, my father took the rosary on the crossroads, in front of the forest, he made a cross with us, Niemczysko dug up his father, and they shot him in the forest, 150 meters from the house." Marianna Borkowska had a nervous breakdown after her husband's death. She was unable to farm. 5. Andrzej Zdulski - on behalf of Józef and Julianna Zdulski, his parents. Józef and Julianna Zdulski lived with their children in the area of Biała Rawska, where most of the villagers had Jewish roots. The Zdulskis were a very respected and highly esteemed family, Józef was socially active and was the head of the village, and Julianna was an exemplary housekeeper, who took excellent care of their home and family. After the outbreak of World War II, Józef Zdulski started acting as a liaison in the underground organization. He also used his position in the community to help Jews, whom he made ID cards. In order to avoid being caught, the man cleverly covered the part of the stamp with the corner of the card. When he was accused of issuing such documents to Jews, he showed his stamp, which in contrast to the one on Jewish documents was not scrapped. In addition, Zdulski hid a little Jewish girl in the attic of their home for a few weeks.